Howard L. Teplinsky is Chairman of Levin Ginsburg’s litigation practice. 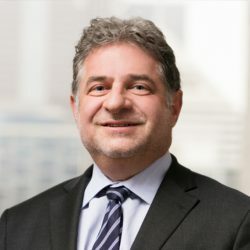 Howard has been a trial lawyer for over 30 years and represents and counsels Fortune 500 companies as well as small businesses and individuals in a variety of commercial disputes. Howard represents a range of commercial clients including real estate developers, national franchisors, lenders, employers, contractors, insurance companies, landlords, shareholders, officers and directors, bankruptcy creditors, condominium associations and equipment leasing companies in disputes arising in state and federal courts at both the trial and appellate court levels. Howard also regularly represents clients in matters before the American Arbitration Association. In 2016, Howard was appointed by the Illinois Attorney Registration and Disciplinary Commission as Chairman of an Inquiry Board panel. Howard is a trained mediator, having completed the DePaul University College of Law Center for Dispute Resolution course in mediation. Howard is also actively involved in the Chicago Legal Community. Howard routinely serves as a judge and mentor in the national and local law student moot court competitions sponsored by the American and Chicago Bar Associations. He also coaches a mock trial advocacy team at the John Marshall Law School, where he is also an Adjunct Faculty Member.